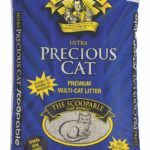 Catit Jumbo Hooded Litter Box Review - Is It Large Enough For Your Cat? 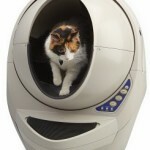 (4.6/5) Catit Jumbo Hooded litter box gives cats privacy and enough room inside to feel comfortable to turn around when doing their business. The box provides high walls to keep urine and litter better contained. 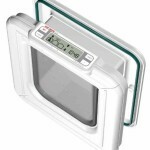 This enclosed litter box features a hinged top that folds back for easy cleaning, including the transparent swinging door in front of the unit that can be folded back as well and keep it on top of the litter box. 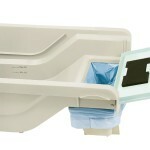 Additiontally, the top features a hinged handle for easy carrying. 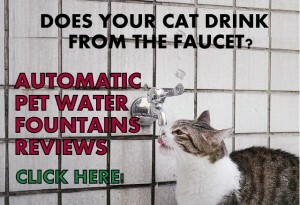 Catit Jumbo has a carbon-impregnated filter that helps to contain odors. 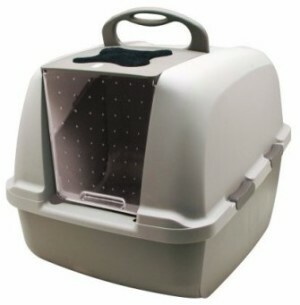 The litter box features a hinged top with a swinging transparent door in front that can be folded back to sit on top. You can flip the door on top to clean the litter box and put in more litter. The cat enters the litter box by pushing the swinging door and does its business. After that, the cat needs to push the door to exit the litter box. If your cat does not like the swinging door you can keep the entry opened all the time by just folding the flap back. The unit consists of two parts that get assembled, the top and the bottom. They are attached by two sliding latches on each side that keep both parts together. 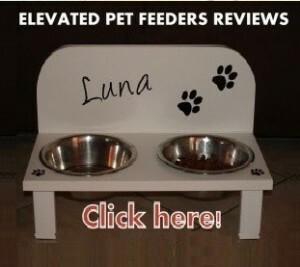 The top part has a handle to carry the litter box when empty. 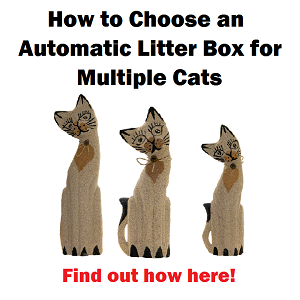 To scoop the litter box you can either flip the lid and fold it back which is the easiest way, or remove the top part completely. If you want to take the top part off it’s more convenient to keep the lid/hood just sitting on top of the bottom part without using the latches so you can just pull it off. However, you can’t carry the unit using the litter box this way. Although the litter box is large it does not seem to take a whole lot of room. Cats feel trapped or may get trapped with the flap/door (The door is easy to fold back to keep the entry open). 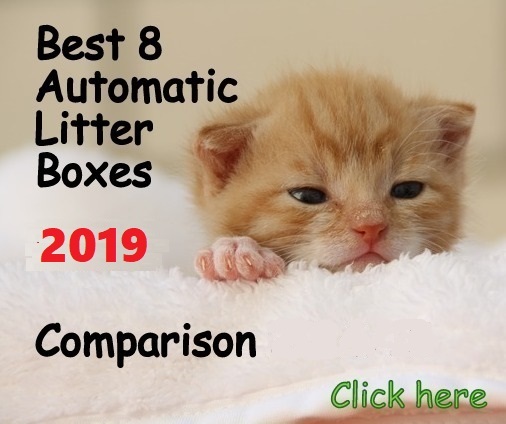 Catit Jumbo cat litter box offers a good option if you are looking for an enclosed litter box with high walls and it’s the best seller in hooded litter pans. 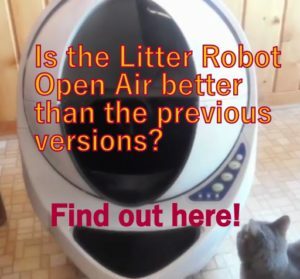 The fact that this litter box is enclosed, it doesn’t mean it contains or reduces odors 100%. 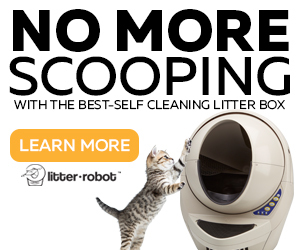 Like ALL litter boxes, it’s more important the litter used and the frenquency of cleaning than the litter box itself. 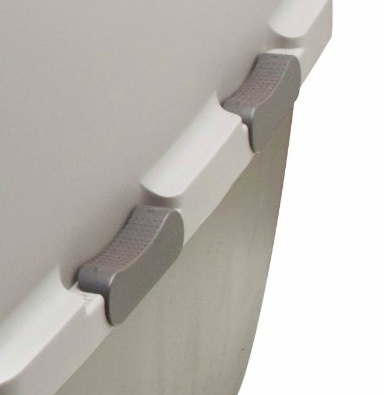 If you are thinking about carrying this litter box when filled with litter, the handle can’t handle the weight and may break. Just don’t carry the unit when full with litter. 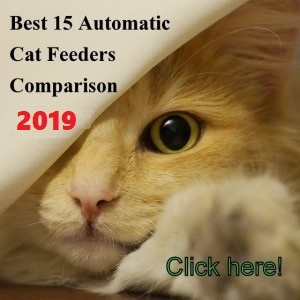 Catit Hooded Pan litter box is very large, check here in Amazon a very funny picture of a contortionist lady being able to put her body inside the litter box.